I confess. Last weekend we were in California, taking our great-grandchildren (and children) Trick or Treating. For years, I took the three grandchildren up and down the streets of Modesto, knocking on doors and threatening the worse if they didn’t produce candy. Actually, the experience remains one of the highlights of my year. But here’s an unexpected surprise for you. We are taking a light-hearted retreat from the usual heavy Middle-Eastern news. This year in Israel Halloween is out; Commemorating the Battle of Beersheba is in. Bet you’ve never heard of this event that occurred in 1917 on October 31. 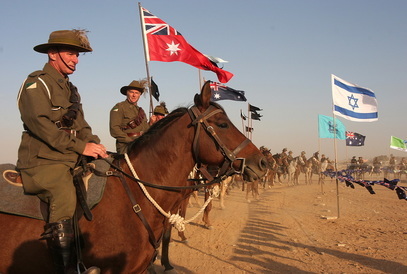 The Battle of Beersheba was the first major victory for Britain in World War I and ultimately laid the groundwork for what in time would become the Balfour Declaration that renewed the hope of the Jewish people to become a nation after 2,000 years in exile. Before the battle, the British had been defeated four times by the Turkish army. Their failure in the Dardanelles led to the resignation of Winston Churchill as the First Lord of the Admiralty. Churchill’s push for a naval invasion in Gallipoli led to 400,000 casualties on both sides and an ignominious Allied defeat. At the battle of Kut in Iraq, the British were again defeated and surrendered to the Turks. They were again badly beaten twice fighting for Gaza. The defeats led to a new command under General Edmund Allenby, a no-nonsense giant of a man called “The Bull.” Another swashbuckling military office appeared to ride his horse close to the Turks, was fired upon, fell forward, dropped a shoulder back covered with blood, and rode off appearing to be hit. All part of plan to deceive the Turks, making them think an attack on Beersheba was only a ploy. In reality, the small city was the real objective. The Australian 4th and the 12th Light Horse Brigades mounted a frontal charge against the Turk’s double-lined defensive trench light of defense and rushed forward. The horses charged over the trenches and the soldiers fought the Turks in hand-to-hand combats, meeting bullets with bayonets. The enormous courage of the Allied soldiers defeated the Turks, took Beersheba, led to the liberation of Palestine, and eventually the fall of the Ottoman Empire. Although happening a hundred years ago, the battle remains an important event for what was to become Israel. The great cavalry advance was the last horse and rider charge in military history.